Holly, originally from Corona, California, has been serving in Mexico for 7 years. 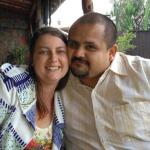 Tony Salgado, (born and raised in Ensenada) and Holly were married April 2017 after having met at a Bible College in Ensenada where they graduated and continued serving up until their wedding. Now, after having graduated from Calvary Training Center in La Gloria TJ, they are working alongside their pastor in Ensenada, training to plant a church in Otay, Tijuana, Mexico. Their vision is to plant a church, raise up leaders, and that these people can be involved in the ministry. The next goal is to build a rehab center or discipleship for youth and have the same people from the church involved.